Download the MP3 PodCast HERE.Point your RSS News Reader to subscribe to our PodCast here. This PodCast sponsored by Small Dog Electronics! The Apple Quiz Contest Winner! Jim Howells of Elgin, Ill.! Jim will soon be the proud owner of the Digital Fidelity One speaker system from Rogersound Labs! Check out Rogersound Labs here for more information on the speakers! Chris Seibold returns with Not Mac News! And if one minute of Chris is not enough, be sure to listen to the interview Chris did with us about his latest ebook, iMovie on the Cheap! Tim takes a look at the Newer Technology RoadTrip! FM transmitter (88.9MHz model). 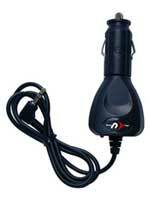 If you are in the market for an inexpensive FM transmitter for your iPod, check it out here. Only $19.99.